Childhood Obesity: Time for a New Narrative, this is the first webinar in the HCC Childhood Obesity Prevention Webinar Series. The HCC is pleased to announce the first webinar series in support of the Civil Society Action Plan 2017-2021: Preventing Childhood Obesity in the Caribbean titled “Building Advocacy Capacity for Childhood Obesity Prevention in CARICOM”. This series consists of webinars intended to build the capacity of civil society organisations (CSO’s) and other key stakeholders advocating for and implementing childhood obesity prevention policies in the region. The series highlights policies that encourage the creation of healthier food environments including healthy school policies, front-of-package warning labels and taxation on sugar-sweetened beverages. The series also aims to build advocacy capacity for the promotion of physical activity among children and adolescents through the creation of active communities and countries. 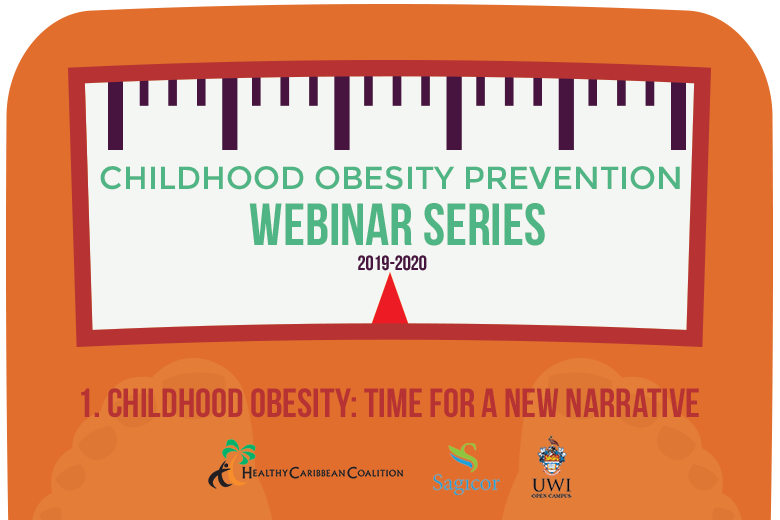 The webinars will showcase the experiences and lessons learned from obesity prevention advocates and highlight good practices in the design, implementation, monitoring and evaluation of policies aimed at reducing childhood obesity and overweight in the Caribbean. The first webinar explores the burden and drivers of childhood obesity in the Caribbean, provides insight into global and regional policy responses to childhood obesity, emphasizes the importance of sensitizing the public before introducing policies and highlights the key role youth play in the childhood obesity prevention agenda. Time: 10:00 – 11:30 a.m. E.S.T. Individual webinar details will be released as the series progresses. All webinars are facilitated by UWI Open Campus using Blackboard Collaborate. If you have any questions or for more information, contact jenna.thompson@healthycaribbean.org. Once you have registered a link will be emailed to you closer to the date of the webinar. ---AnguillaAntigua and BarbudaArubaBahamasBarbadosBelizeBermudaBonaireCayman IslandsCubaCuracaoDominicaDominican RepublicGrenadaGuadeloupeGuyanaHaitiInternationalJamaicaMartiniqueMontserratRegionalSabaSaint EustatiusSaint Kitts and NevisSaint LuciaSaint MaartenSaint Vincent and The GrenadinesSurinameTrinidad and TobagoTurks and Caicos IslandsVirgin Islands BritishVirgin Islands U.S.